"I have never understood why, when there are beautiful dogs one can acquire, people should go out of their way to acquire non-beautiful dogs. I know better than to give examples, because nothing arouses owners more than the suggestion that their breed is less than the most desirable in the world. But admit it, Cavalier King Charles Spaniels are strikingly attractive. And just as one feels the impulse to stroke them, they feel the impulse to be stroked. Sam and Fred can spend hours being fondled, as you read your book, or talk to your guest. But then they will exhibit their independence. It disappoints me only that they do not like my study. Rowley used to come to my study once every hour or so, to have an extended love-in, during which we would exchange our eternal vows. Sam and Fred will accompany me to my study, and then leave, to play elsewhere or simply to be in the kitchen, or, preferably -- always, if she is there -- with Pat." As a side note, the Reagan's "Rex" came to them thru the Buckeys. He was, I think, the first and so far only Cavalier King Charles Spaniel in the White House. 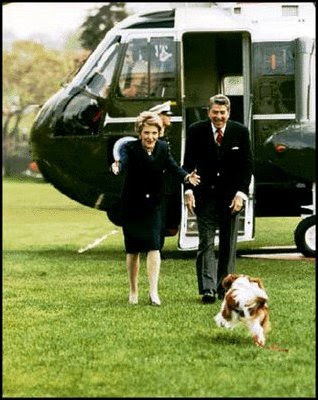 I remember seeing him on the White House lawn, coming and going with President Reagan and the First Lady as they boarded the helicopter. Rex went to Camp David this way and also flew on Air Force One for getaways to the Ranch in California. Rex was such a good ambassador for his breed and looked very much as if he belonged in the White House. Those were happy years! Above photo was located in "Presidential Pets" on the White House website.